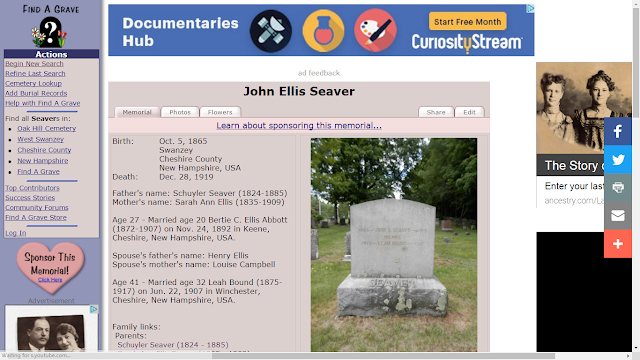 I received an Ancestry Hint last night that led me to Find A Grave memorials at Oak Hill Cemetery in West Swanzey, Cheshire County, New Hampshire. 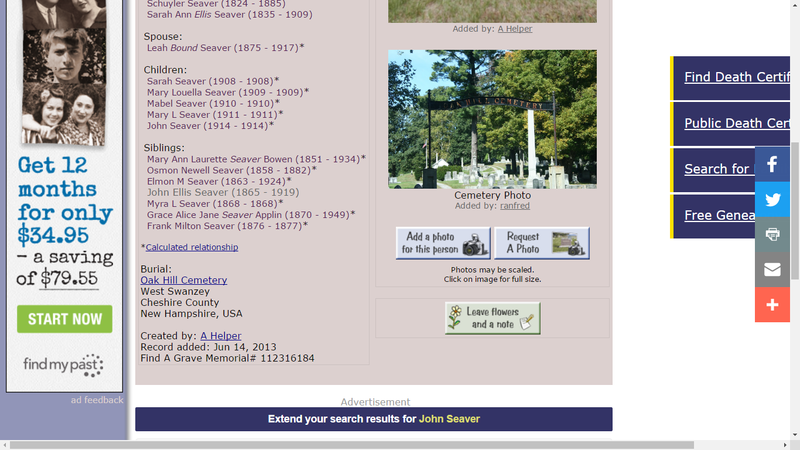 When I saw the data for the John Ellis and Leah (Bound) Seaver family, my heart sank. I almost didn't add their data to my RootsMagic family tree file, but I did, almost reverently. Why almost reverently? Because I knew that these five children are probably forgotten to history, and I needed to record them somewhere. This is so sad. And it's life. We don't know why these children died. Was it a genetic anomaly? Was it health issues? Was it poor parenting? I have no clue. John Ellis Seaver was my 5th cousin 4 times removed, and these children were my 6th cousins 3 times removed. I have no real ties to the family. But my heart sank when I saw this - it reminded me that not every family is perfect, not every family has a long life, and not every family has happiness and joy. John died in 1919 and Leah died in 1917. John's first wife died in 1907, apparently without children. I can't imagine John and Leah's lives and heartaches. This article hit home for me. Years ago I was researching one of my maternal lines which included Henry KIGER who married Margaret NELSON. Henry was age 34 when they married and had their 10 children. Nothing in my research had indicated Henry had married prior to his marriage to Margaret although I did have a "stray" Rebecca KIGER listed in the 1804 will of her father Thomas CLARK. Who was this Rebecca KIGER daughter of Thomas CLARK who died in 1804? And who had she married? Then a cousin showed me a family Bible he had inherited which included family records he could not identify. 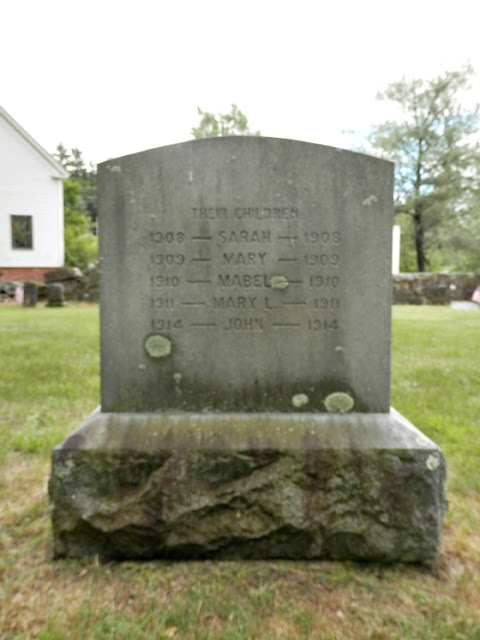 There, listed in the Bible, were Henry KIGER and wife Rebecca and their two children: John KIGER born 15 April 1801, died 15 Nov. 1803. Simon KIGER born 24 June 1803, died 8 Aug. 1803. Rebecca KIGER born 9 Feb. 1780, died 14 Dec. 1804. On 23 April 1806 Henry had married Margaret NELSON and this was followed by the births and listings of their 10 children in the Bible. But for the Bible listing these 3 lives would have been lost in the family tree and probably forgotten forever. Forgotten lives...but for this.